Beat the Q is a Sydney startup that enables people to order coffee through a mobile or the Web and skip the queue at the café. Co-founders Adam Theobald and Scott Player seek to address “growing impatience” among café customers. Theobald started out as a programmer, moved to financial markets and then got involved in technology startups, while Player has a background in marketing. They came up with the idea for Beat the Q while lining up for food in a long queue at a Jack Johnson concert, Player said. When they got to the front, they ordered 50 chicken burgers and sold them at a premium to the people waiting in the back. Player said the experience taught them that people are willing to pay more for convenience. Cafés seemed like a natural place to apply the idea, particularly given Theobald’s love of coffee, he said. The startup worked closely with cafés from the start as it shaped the app, Theobald said. After six months of development, Beat the Q launched a beta trial in April 2011. The public launch followed in August the same year. Customers order through the Beat the Q website. While the site is optimised for mobile, the startup also offers mobile apps for Android and Apple devices. In addition, PayPal has recently integrated Beat the Q into its own mobile app. The co-founders self-funded initial development of the startup, said Theobald. After addressing their own initial concerns about the idea, they sought additional funding from friends and family. Since then, Beat the Q has had two rounds of funding from venture capital, he said. On the revenue side, the startup charges each café a monthly license fee covering support and maintenance. It also takes a per-sale service fee covering transaction costs. The coffee drinkers themselves pay nothing for the app. Unlike at the Jack Johnson concert, they do not pay more for coffee than they would in the café. Customers prepay for coffee, topping up their Beat the Q accounts using credit cards or PayPal online, or with cash at participating cafés. The startup is now also rolling out a pay-as-you-go method. 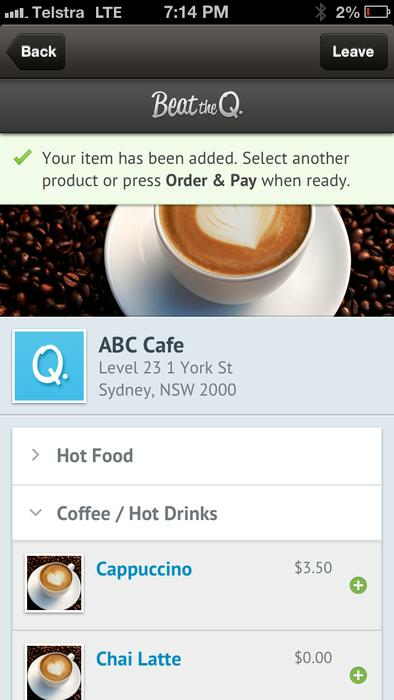 Today, about 160 cafés in Australia work with Beat the Q, with new cafés coming aboard every few days, said Player. So far, most are located in Beat the Q’s hometown of Sydney, but other markets are growing. Theobald said the first cafés to sign up didn’t need much convincing to try the service because it addressed a pain point for them. Since then, customers have driven sales of the service to new merchants, he said. While the focus right now is on coffee, the business could later expand into other market verticals like pizza delivery, said Player. “We will very imminently launch Beat the Q in other geographies,” said Theobald. However, the startup plans to keep its home base in Australia, he said. “Australia has a very unique café culture,” with many independent coffee houses, he noted. However, while major companies like Starbucks have dominated the US market, more independent cafés are starting to pop up there, he said. The significant growth in the Australian startup scene in the last couple of years has fuelled excitement among founders and encouraged more people to get involved, Beat the Q's co-founders said. “Something that is really exciting is the emergence of the incubator,” said Theobald. Incubators have fuelled a change from a startup environment that was protective and concerned about competition to one that is much more collaborative, he said. Meanwhile, Theobald said he’s drinking more caffeine than ever.